I want to share what has spurred me to be baptized in the name of Jesus Christ. For the people who do not know what a baptism is, it’s a public demonstration of my personal faith towards Jesus Christ who died for my sins. 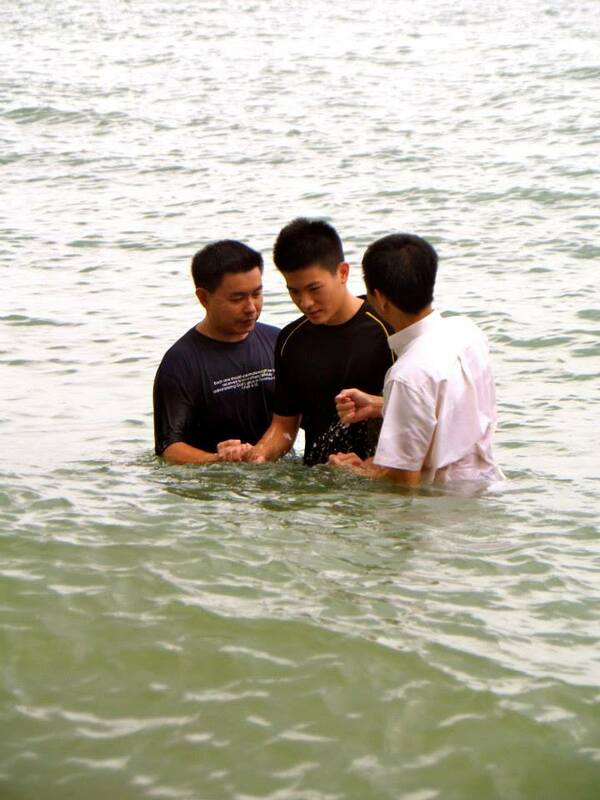 I got submerged into water, allowing the death of my old sinful life and the beginning of a new life of Christ. Throughout my life, the Bible, testimonies, and personal encounters with God’s presence, reinforced with rational and logical evaluation, have proved God’s existence, and have shown that some things just cannot be proved using physical means. 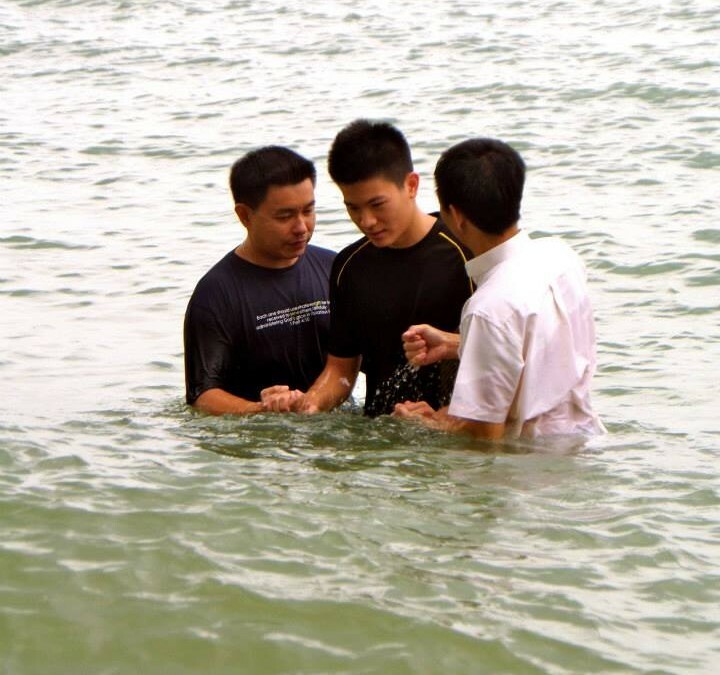 What spurred me to get baptised started during my final IB (International Baccalaureate) exams in Thailand. I was amazed at how God granted me calmness and peace before, during and after the exams. He also gave me overflowing confidence, up to the extent that I thought I could ace almost every exam, potentially getting 40+ out of 45 maximum points. I knew God had a plan, and thought he gave me this confidence and a spurt of knowledge to get a high grade, ultimately and hopefully leading to a successful and smooth university matriculation. Before I got my results, I decided that whatever result I got, I would know that God has a plan for me and that he would give me the best future for me.I got 34. That was just a bit above average. I was shocked, confused and disappointed in God, but held to his promise. I applied to NUS and NTU for Environmental Engineering, hoping for a miracle. Enrolling into a local Singaporean university has always been a dream, but it would be hard to get into. A few friends told me to retake my IB exams, but I really believed my results had a specific purpose, so I refused and remained steadfast. A transition of life occurred. I left to Singapore to serve my National Service. I have never left my family before for such a long time, and homesickness naturally brought me down emotionally. However thanks to my WRPF church cell, Alpha 2, aka #bestcellever, my life was pulled together on track. My cell consisted of 6-8 regulars who were able to share openly and honestly, and through this, I found another family that I could love. I was grateful to the WRPF church community and especially YAY for welcoming me. I was always touched by their sharings and dynamic worship, and of course the Chee family I stayed with, especially Elaine, for encouraging and helping me in my spiritual walk. One day, the church prayed for me and my army life. At that time I was frustrated because my training in camp consisted of watching movies everyday. A waste of time. I came all the way here to protect my country, not to be entertained. I was getting impatient. During the prayer, Uncle Francis Shin had a vision for me, he said that a pearl came into his mind; a pearl is made by irritations of dust, and in time, it turns into a beautiful pearl. A truly mind-blowing transformation. It was the first time someone had a prophetic vision for me, so I was doubtful of it. Could it be just a product of his mind? I thought. I returned to camp a few days later, and a motivational poster grabbed my attention. It was a picture of a pearl, with text next to it: “Most of us can afford to take a lesson from the oyster. The most extraordinary thing about the oyster is this: Irritations get into his shell; he does not like them and tries to get rid of them. But when he cannot get rid of them he settles down to make them one of the most beautiful things in the world. My friends, if there are irritations in our lives, today there is only one prescription: A pearl called patience.” Wow! I believe this is not a coincidence, but an encounter planned by God. The vision was true. And what it wrote was true; I can’t escape National Service, so I’m going to have to change my attitude and be patient. It taught me that these 2 years of service is a trial, a test of patience, so I need to adjust and have a wider, different outlook on NS. He must also have a plan for my university application results which I have to patiently wait for. Moreover, a verse came in mind: “Whatever you do, work at it with all your heart, as working for the Lord, not for human masters, since you know that you will receive an inheritance from the Lord as a reward. It is the Lord Christ you are serving.” Colossians 3:23-24. Sorry Encik (Malay for Warrant Officers), Sorry Sir, with all due respect, but I’m under a greater leader that has greater authority and manpower. And true enough, I was posted out from BMT to protect a camp, a job I take pride in, together with a group of awesome, irreplaceable group of people who I can share openly with. A few months after enlistment, I got a reply letter from NUS and NTU regarding my application. I got rejected by both and suffered a slight depression because I thought God has a wonderful plan for me. I felt immense fear of not knowing how the future will pan out after finishing my national service. I began to research on overseas universities, but it would really burden my parents in terms of finance. I became hungry for God, I impatiently needed an explanation! Why aren’t You answering my prayers? But, under a year later, by God’s grace, I got accepted to NTU when I applied a second time! At that time, God had revealed his plan. All thanks to Him. I’m still amazed how they accepted me with only 34 points. In retrospect, the year of trial tested my patience and faith. God must have been thinking, Why is Wen Por worrying when everything is in My control? I find it hilarious as to how I worried so much, but this catalyzed my spiritual walk because I was more desperate to know His ways. But listen to this: Would I be as spiritually hungry, be as spiritually mature, be as spiritually knowledgeable of Christ as I am now if I had been accepted in the first year? My faith right now has definitely increased compared to last year. Thank God I was not accepted by the universities at the first application. God wanted me to be more desperate for Him, and ascend to another spiritual level. In every phase of life, there are problems of its own, and I am actually excited for each trial, because as long as I have faith in Jesus Christ, there will be more to gain than loss in the end. I actually appreciate the trial… and kind of want to go through it again. I also want to extend thanks to my mum, who came all the way from Bangkok to witness my baptism! I hope this long testimony inspires you all. For the prebelievers, hopefully you will be more open to Christianity and maybe, just maybe, consider the fact that maybe there is a God up there? I believe some things are not by luck and coincidence, and God is in control of everything.